Vernon Betts was born and raised in St. Louis, Missouri. He attended St. Louis Public schools and is a graduate of Beaumont High School class of 1971. Vernon has an A.S. degree from St. Louis Community College and a B.A. from Harris Stowe. He started his working career as a St. Louis Public School Teacher. He then worked for 30 years at AmerenUE and retired as an IT Supervisor in 2007. 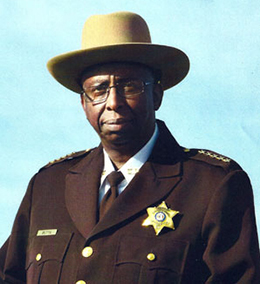 After retiring from AmernUE, he worked at the St. Louis Sheriff’s Office of City of St. Louis as a Deputy Sheriff. He was elected Sheriff in 2016 and is currently serving a four year term as the Sheriff for the City of St. Louis. Vernon Betts has been an active leader in his community for many years. He has been a block captain and President of his neighborhood association. He is a member of the Urban League, Chaplain and Executive Board member of the 100 Black Men, Executive Board Member of the St. Louis Branch of the NAACP, and a Member of the Missouri Sheriff’s Association. He participates in mentoring programs such as Maleness to Manhood at Matthews Dickey Boys and Girls Club and a mentor to troubled youth at the Juvenile Detention Center. Vernon is very active member and minister at his church, Shalom Church City of Peace. He is the proud father of 5 children and married to his wife Lori of 25 years.